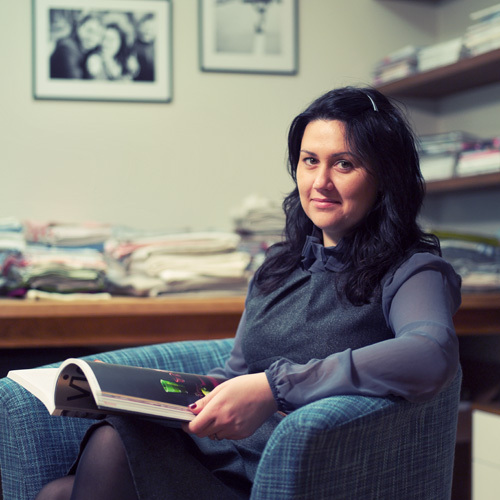 My name is Inga Lukauskiene, and I am a Lithuanian-born interior designer. I have a real passion for textiles, particularly linen. I love absolutely everything about it: its strength, texture and durability; the way it ages beautifully; and - I have to admit - even its natural crumples. Over past centuries, in many cultures worldwide, one of the most important heirlooms a loving mother could give to her daughter on her wedding day was linen passed down from previous generations. Now, linen has become a key must-have for stylish homes with a pared back aesthetic and a focus on quality. Lithuania, and my family, have strong traditions of flax growing and linen production, and I have always felt that more could be done to represent the beauty of Lithuanian linen and fine craftsmanship. With this idea in mind, I graduated from London’s KLC School of Design, and decided to focus on creating beautiful home accessories from linen. LinenMe is the result. I am excited to introduce you to LinenMe, the brand you can trust for one of the widest ranges of simple, sustainable and stunning linen homewares. I hope you enjoy exploring our edit of home textiles and clothes and share our values. We are a small yet expanding family business. Inga is one of the third generation in her family to work in the flax industry, bringing a wealth of expertise and knowledge to our products. Because we are not a huge corporate giant we are able to offer you a more personal approach. You get the individual attention to detail of a bespoke luxury brand, without the price tag. We pride ourselves on giving great customer service and offering advice and guidance wherever needed. All our product designs are inspired by what our customers need and are meticulously developed by Inga and our team. These designs are then crafted using a combination of traditional and cutting-edge technologies to produce top quality, long-lasting linenwares that are loved worldwide. We understand linen - how it cuts, how it sews and how to bring out the best in each piece of fabric. Every product is hand-checked to ensure it meets the most stringent quality standards. Our linens are made with love, and made to last. We know you want the freedom to choose just the right linen pieces for your home or wardrobe. Because we have our own manufacturing unit we can offer you an unparalleled choice of colours and styles. We stock over 1000 different linen fabrics and all our products are made to order. Our bespoke service means that you can create your own, individualised look and weave your personal story through our beautiful linen. Modern life can be demanding. That’s why our products are designed to encourage you to slow down, appreciate the smaller things in life and to relax in comfort. Coming home should feel like a chance to shake off the stresses of the outside world, so we want you to wrap yourself in, sleep under, enjoy food with and wear linen products that are understated and simple. Your home is your sanctuary, and we want to make it feel cozier and look even better. At LinenMe we are committed to ensuring our products are sustainably produced. Linen itself is an environmentally-friendly fabric as it requires fewer resources to grow and process, and is biodegradable. We use every last inch of fabric in our production process to minimise waste, and we craft products that are made to last, in keeping with our love of slow-living and considered consumption.